Cross Streets: Thomas/Power Directions: Go North to EagleCrest, East to Teton Street. Right through the gate. 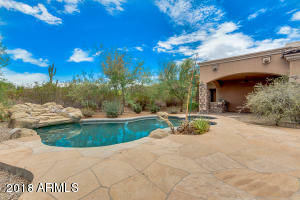 Right on Pinnacle Hills Circle to your new incredible home. Public Remarks: RENOVATIONS COMPLETED 4/2019! Peaceful Serenity with Incredible Mountain and Golf Course Views!This spectacular estate is one of a kind situated on a private cul-de-sac street on the Golf Course. Viking Professional Series Stainless Appliances, Exquisite granite tops. Brilliantly planned out 3-way split floorplan with 4 bedrooms, a Den, Teen Room & Exercise Room. Custom Stone and wood flooring.. beautiful upgrades for the buyer who wants perfection. Go outside and enjoy the gorgeous backyard oasis. This home is Absolutely amazing. Property has been appraised by Josephs Appraisal Group. Prepared by Kathy Ebiner Team All information should be verified by the recipient and none is guaranteed as accurate by ARMLS. DND2 ( D o N ot D isplay or D isclose) - the data in fields marked with DND2 is confidential, for agent use only, and may not be shared with customers or clients in any manner whatsoever. 04/19/2019 4:23 PM © 2019 ARMLS and FBS.